A Cold and wet morning awoke us and the Moon eyes Christmas show must go on, I knew there would be no drag racing but still like to support these shows none the less as it is a super social event and of course, some really cool rides turn up and great to see other people brave the colder temperatures, as this year it is unusually cold for Southern Californian’s. This show is like Santa and only arrives once a year and I am glad we showed up to see the turn out and of course the vendors selling their goods etc. 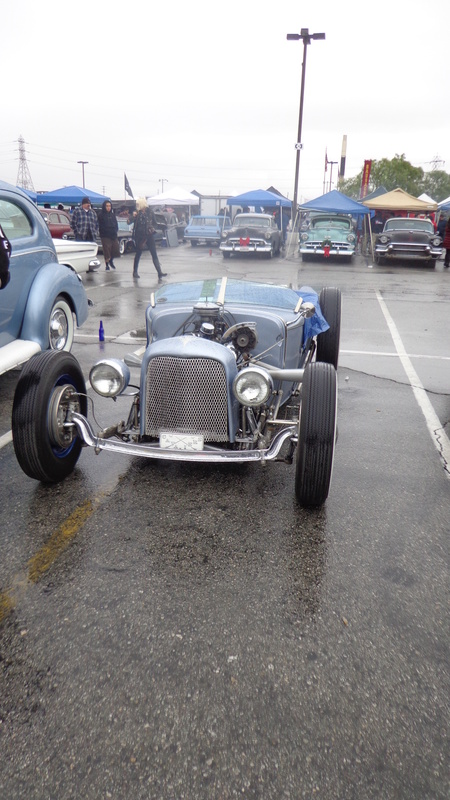 A wet, cold and grey day at irwindale this year- but it didn’t stop people coming out to celebrate the annual event here at the strip. 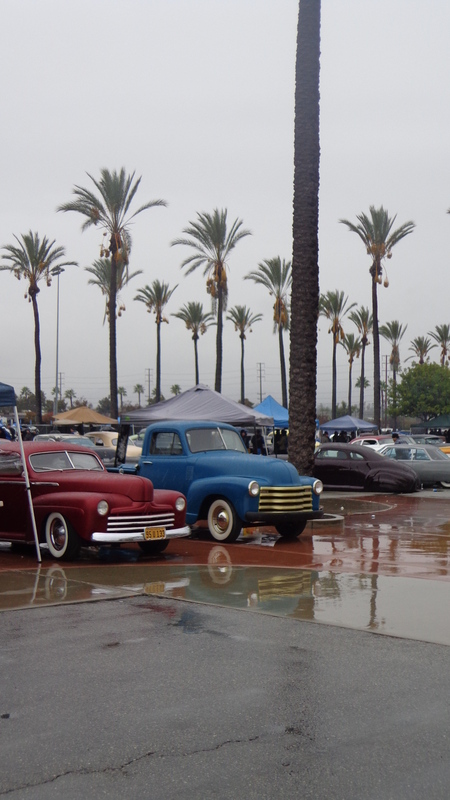 Plenty of So-Cal Vee Dubs attended and showed off what they had for all and sundry. 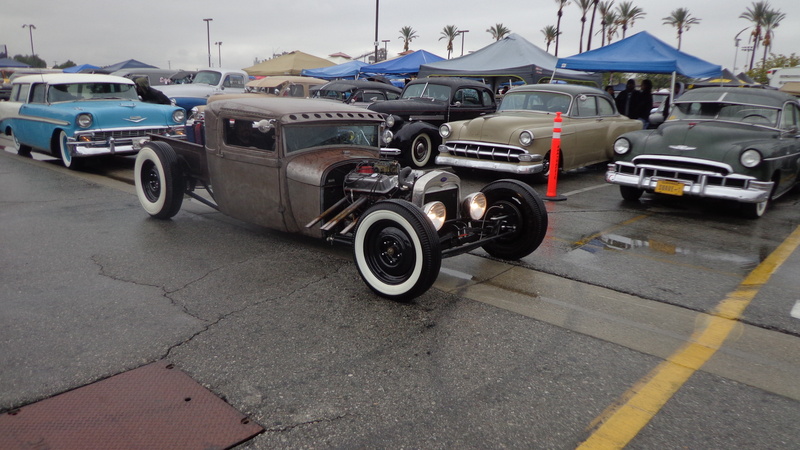 We arrived about 10:30 ish but it was great to see some cool rides and good friends that I had not clapped eyes on in quite some time, so an awesome social event despite the weather. Cool VW Van with Radar rims and old school lettering. 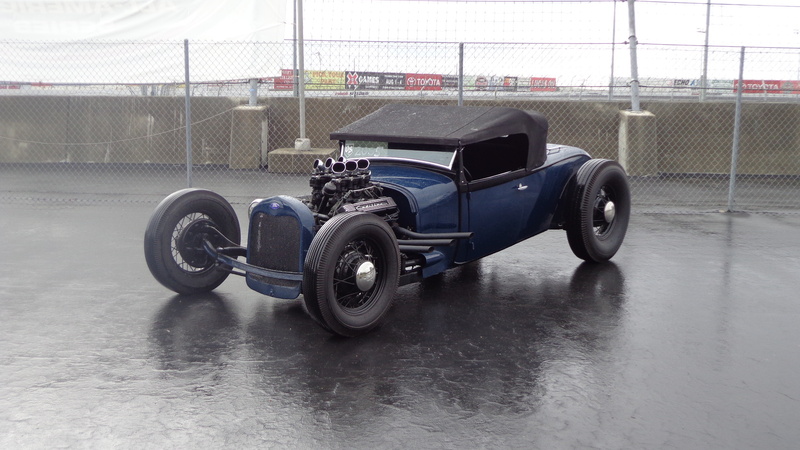 Caddy powered and also a driving ride in this weather is testament to the hardy builders that come out to the show at the colder end of the season. It rained off and on and the temps dropped as the day went along, but we spent a couple of hours there and met some good mates who I had not seen for some time. Cool to see some old style artwork on this Econoline, sporting Candy Blue Steelies and pin line walls. 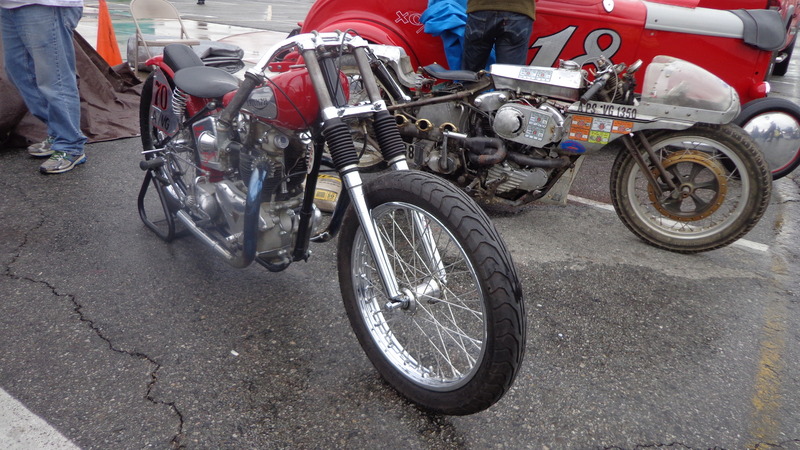 Rides came in and out most of the morning, and that was good as you saw many different customs and rods when you came back down the isles. No Drags as the weather was too bad, but great to see some show up and show us what they had. Today was certainly a day for Pendeltons. 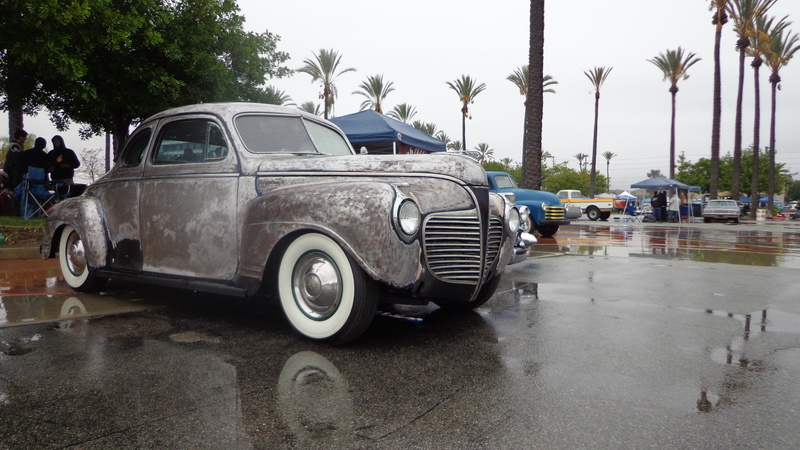 Rain or not, the show has t go on, and- even though there was no drag racing, it was still great to see Customs and Rods attend and show off their hard work that had been put into it all the last 12 months and more. Juan Lopez-Tsmphotography Took these pin up shots as girls braved the weather. Many Customs still showed up and some didn’t even have glass in the vehicles. This one below did and bet they were glad of it. 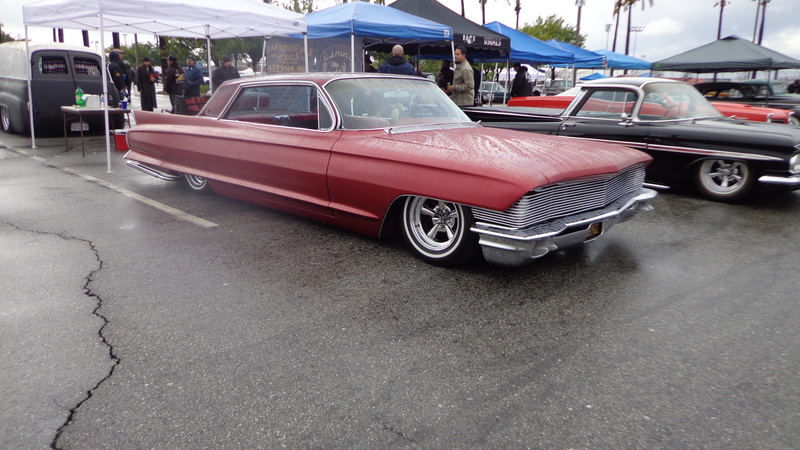 We loved the 62 Caddy, this was low and had a rolled tube front grill. Chevy Custom with DeSoto grill is always sweet to see, as them grills are getting so hard to find nowadays. Now, thats some masking right there. Floating grill is a nice Barris style touch. Chevy Suburban was cleaner than our cats rear end. Plenty of Suede paint out there this year too. Very Sharp looking T-Bird I would of gladly driven home. 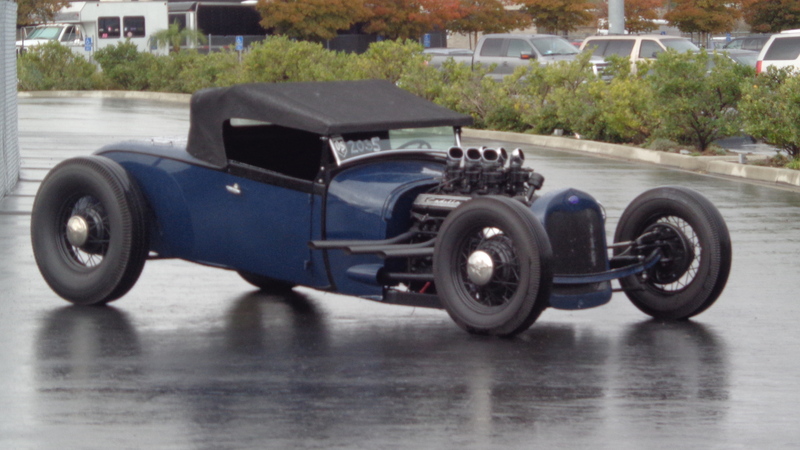 Two door 50 Custom and with candy Root beer paint and also a wicked roof shop was a head turner for me. A lot of subtle work done to this 52/53 and I really like it. Step side was sweet, looks like radars on them too. 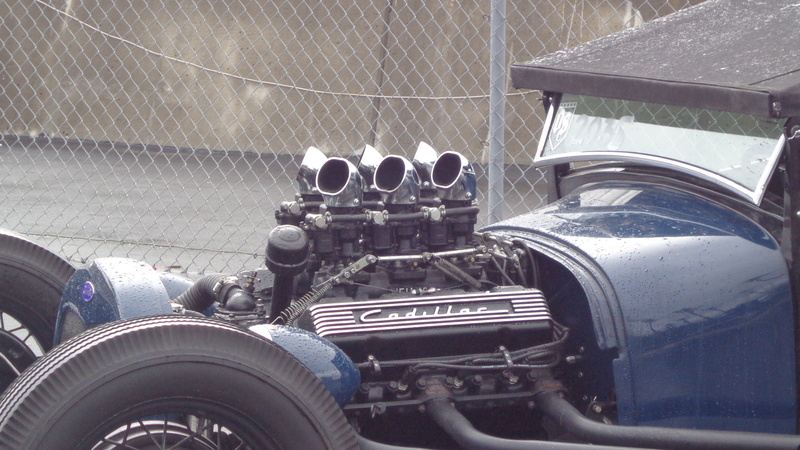 You would not lose this in a parking lot. So some cool rides still to see and glad we made the trip. Aztec Gold is a great color. I really like the Blue Suede. 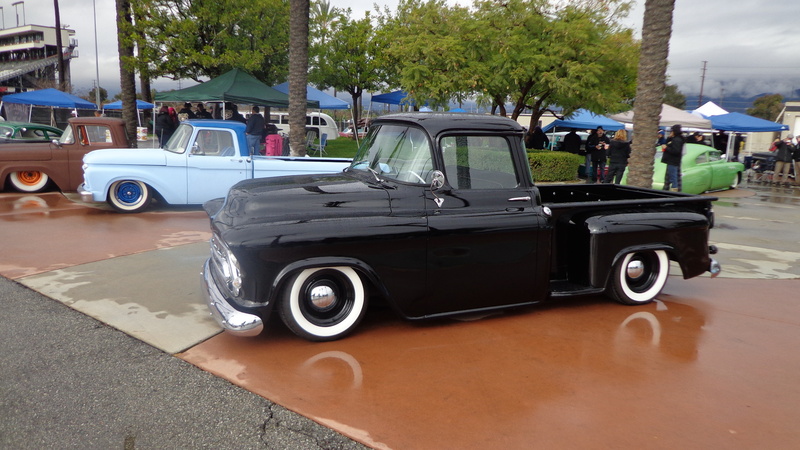 Another clean ride and perfect paint job.With skirts and Sombrero’s. 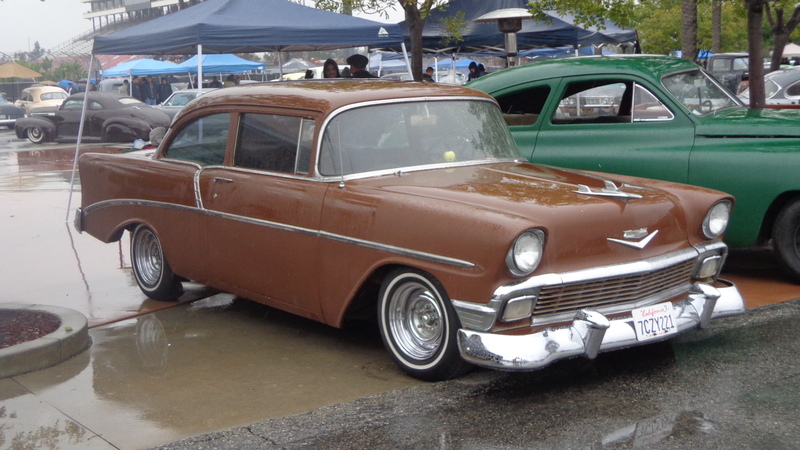 Two Door 56 looked pretty good in this Brown scheme, I see this blapping about our area from time to time. 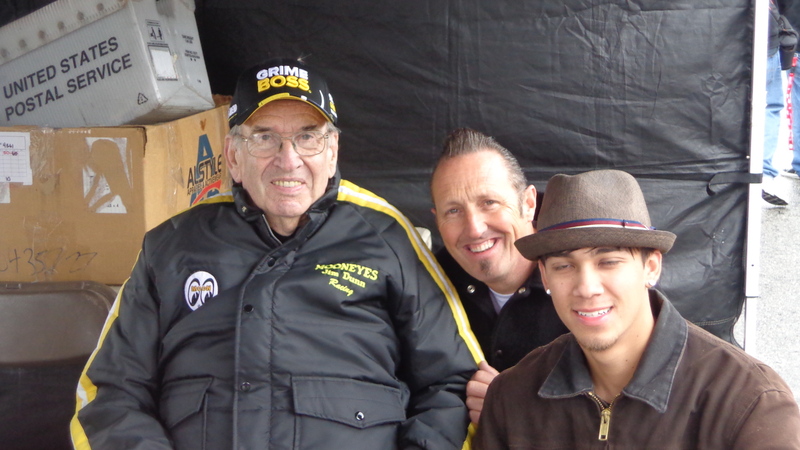 Jim Dunn, me and Dakota, great to see Jim, what a Racing legend. I am quite partial to step sides and this was no exception and looked super slick in Gloss Black. 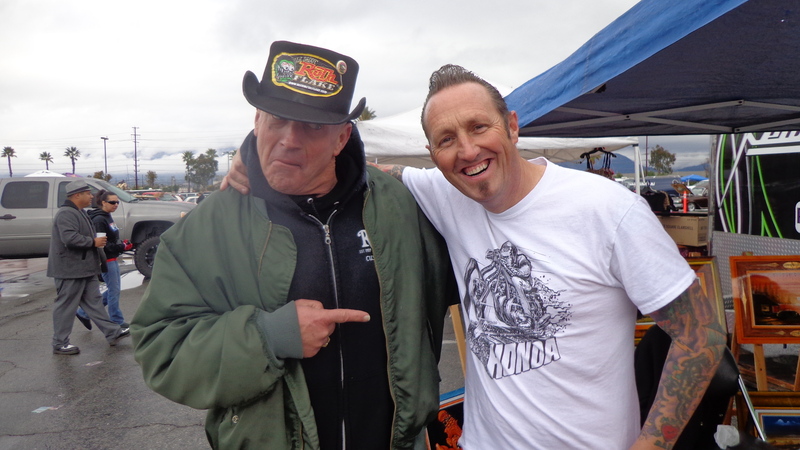 Met up with my long term mate, Dennis Roth, you should check out all the metalflake they now produce and sell. Another year over and we had a good time, met some cool friends and saw some really sweet rides, next year will be bigger and I am hoping the weather gods will be kinder, none the less, we shall still attend, and am thinking of having a booth there too. 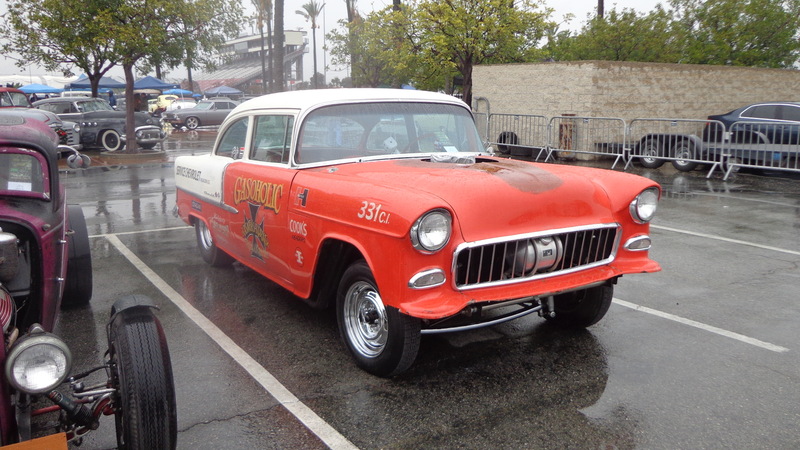 This entry was posted in Blog and tagged brat, chops, customs, drags, gassers, hot rod, moon, mooneyes christmas show, motorcyces, sleds, street rods. Just cool video’s to help you through the day.